Click the link above to visit Instagram and see both photos from the Ara Parseghian statue at the Miami University Cradle of Coaches. 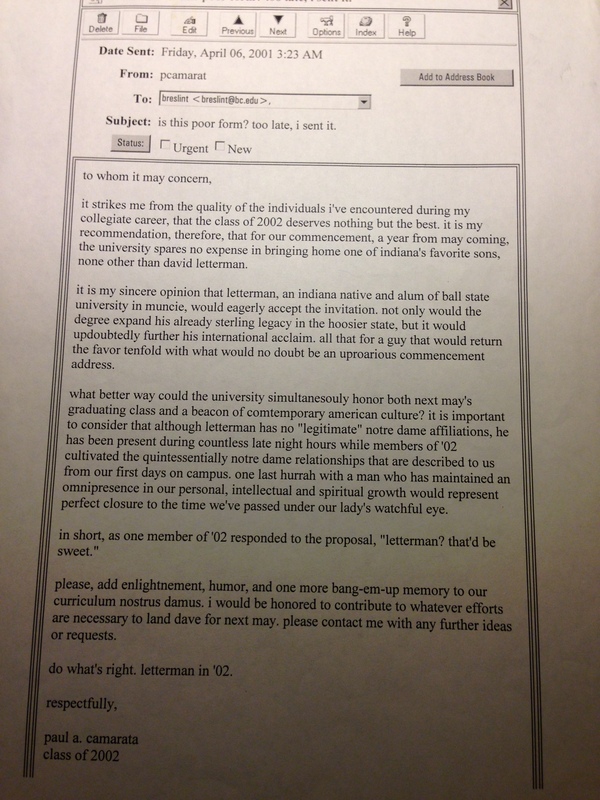 One night, 14ish years ago in Fremantle, Western Australia, I penned a letter to the editors of my college newspaper, advocating you be the keynote speaker at our commencement ceremony, slated to take place roughly one year later. This was no reckless Hail Mary, Dave, the dorkiness of the language notwithstanding (and it is dorky, see below). I gave them more than ample time to run background checks on you, to build a riser for the horn section, to accommodate whatever eclectic Canadian nutritional needs Paul might have. Yet, inexplicably, I never heard back. Instead of you, the school played it safe and booked the president of Mexico, then when he fell through, got lucky by nabbing the late great Tim Russert, who brought the house down. Still, I couldn’t shake the feeling that a great white whale of a chance had been allowed to escape without so much as a chase. 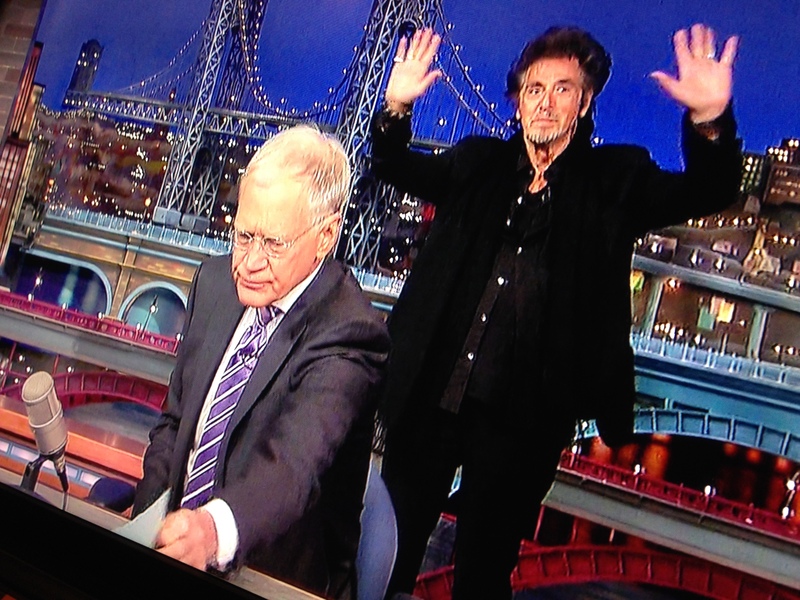 THROWBACK CRAZY – Al Pacino himself sneaks up on Dave, then proceeds to read the numbers during the list of the “Top Ten Reasons Why Max is So Mad” (5-14-15), less than a week before the final Late Show. By way of serendipity a few months back, I came across a copy of my letter to the editors, in the very same week that I read a story on “Collins”, Pacino’s new film. It was about an aging rock star thrust into a cyclone of regretful introspection when it’s brought to his attention that as a young artist in the 1970s, he was the intended recipient of a fan letter from John Lennon. The letter, advising Pacino’s character to stay true to himself and his art, had never arrived. Finding out about it years later, the musician wonders how his life and work might have been different – less kitschy-pop, perhaps — had he gotten the message from Lennon. Well, imagine. It all hit me. I’m no Beatle, but what if the editors had somehow lost my letter? Or, what if they’d gotten it, but it then got lost in translation to the commencement poo-bahs? What other rational explanation could there possibly be, Dave? The president of Mexico! There’s no way to measure how many lives may have been impacted had fate not interfered with you speaking at graduation. But now, so many Mays later, an alignment of the stars between you and the class of 2002 is no longer out of reach. For starters, there’s the forthcoming flexibility in your day planner. Then, the abundance of tailgate parties, round-ups, and reunion events our class convenes on an annual basis. And finally, the fortuitous development that, as you pointed out in the monologue just two weeks ago, you’re dropping your speaking rate. That means you and our alumni board can probably work something out. What great news! It’s like we accidentally made a sound investment that has appreciated into a great treasure. Or at the very least, found an unopened sleeve of Thin Mints buried in the back of the freezer. Briefly before I continue, since it’s looking unlikely I’ll get to say it from the sofa seat on your show, allow me to join the chorus of your recent guests in thanking you for all the yuks over all these years. Many performers are best described as entertainers ; but the rare few, simply as entertaining – so seemingly effortless is their ability to captivate an audience that it never comes off as an act. That’s the good stuff, Dave, and you’ve got it — same as that naturally funny guy or girl who we all knew down the hall in the dorm. I was only a teenager when Johnny signed off, and though I’d never really watched him, I knew his departure was a big deal. So I decided I’d stay up and seize the final opportunity there would ever be to catch Carson. And boy, do I remember that night: how I fell asleep long before Doc struck up the band and woke up the next morning consoling myself that at least I’d always have Dana Carvey’s impersonations to fall back on. All good. This week it’ll be different. 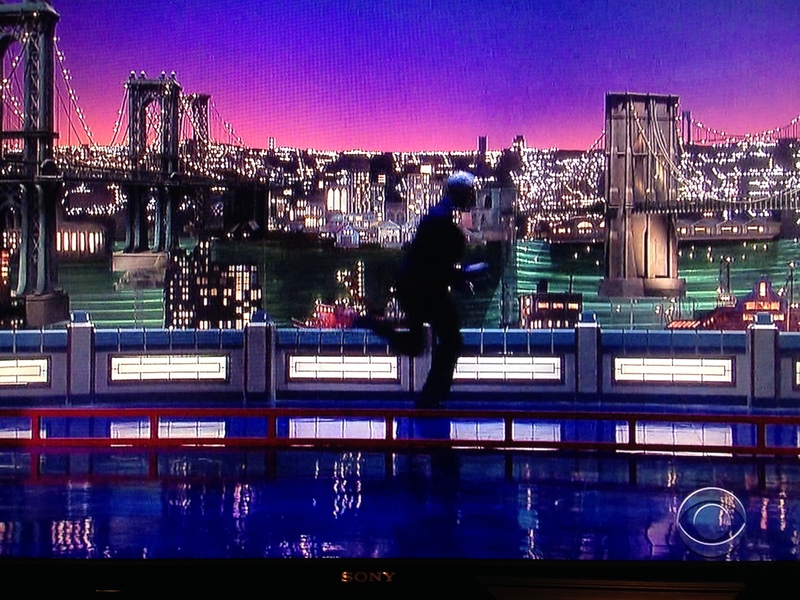 If I were to nod off, I’ll still wake up with my Late Show t-shirt and memories to spare: of watching, of attending a taping, of once seeing Biff in line at The Vatican (my wife doubts the authenticity of this ; a multi-layered blasphemy on her part, in my opinion). And even having all that, next Thursday morning there’ll be little consolation knowing the curtain has dropped for the final time at the Ed Sullivan Theater, onto the same stage where John Lennon once played. His fictional letter in Pacino’s movie was inspired by a real one the Walrus wrote to a real musician who really never received it. It happens, the mail gets lost. Dreams get deferred. Raisins in the sun stand up and dance to Marvin Gaye music. Crazy, zany, bonkers stuff can go down, Dave. You know it. You believe it. You proved it. So see you at the next reunion. Hoo-wah. 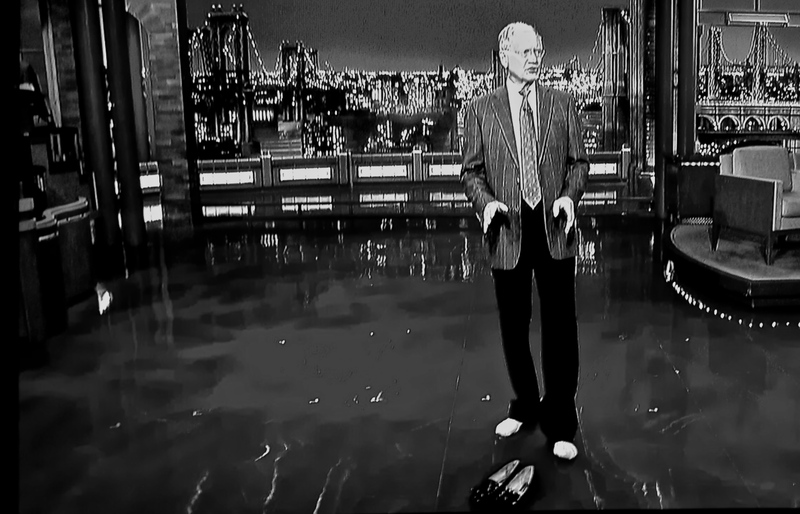 Thanks again for all the laughs. In honor of consecutive stellar performances by Notre Dame to open the 2014 season, we’re dipping back into the archives to share the drawing below. 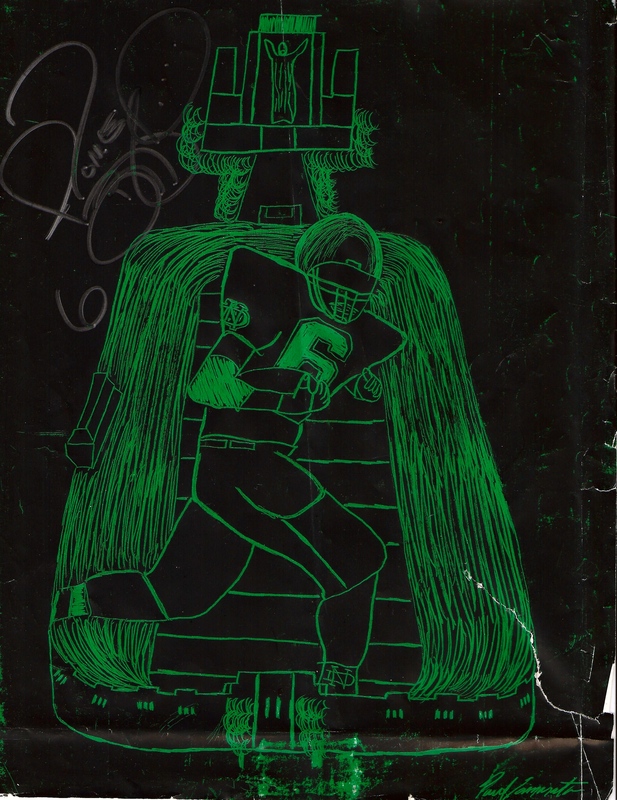 It was done back when I was merely a Tweedlet in Mrs. Davis’s 6th grade art class, and only years later, autographed by the subject, Jerome Bettis. Long before he was nicknamed “The Bus” during his NFL career, Bettis was a bulldozing fullback in South Bend — though even his physical style might have met its match in the Irish defense on display the last two weeks. 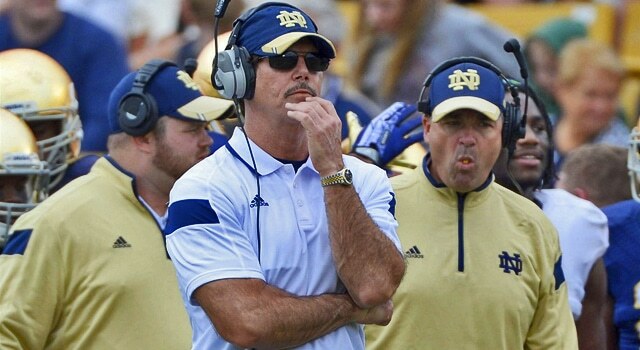 Sure, the now departed Bob Diaco may have resembled Don Draper, but so far his defenses were mere impostors compared with Brian Van Gorder’s Van Goghs. The first year Irish Defensive Coordinator has a name like a Dutch Master but through two games his group is pure Cohiba.